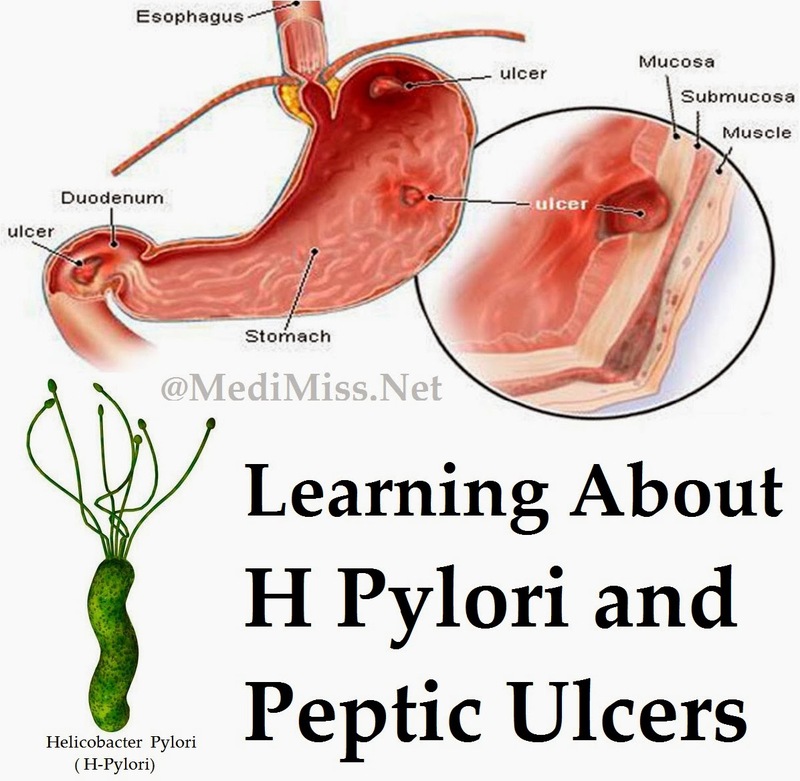 H. pylori bacteria can cause peptic ulcers-sores on the lining of the stomach or duodenum. A sore on the lining of the stomach or small intestine is called a peptic ulcer. Less commonly, a ulcer may develop just above the stomach in the esophagus, the tube that connects the mouth to the stomach. In the stomach its called a gastric ulcer. If it occurs in the small intestine, it is a duodenal ulcer. People can have both gastric and duodenal ulcers at the same time. They also can develop peptic ulcers more than once in their lifetime. Peptic ulcers are not rare. Each year in the United States, about half a million people develop the ulcer.11Ramakrishnan K, Salinas RC. Peptic ulcer disease. American Family Physician. 2007;76(7):1005-1012. 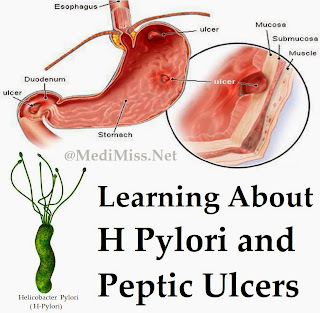 A bacterium called Helicobacter pylori (H. pylori) is a major cause of peptic ulcers. Aspirin and ibuprofen also cause ulcers. Rarely, cancerous or noncancerous tumors in the stomach, duodenum, or pancreas cause ulcers. Ulcers are not caused by stress or eating spicy food, but both can make ulcer symptoms worse. Drinking and smoking can cause ulcers, too. H. pylori is a type of bacteria-a germ that may cause infection. H. pylori infection is common, particularly in developing countries, and often begins in childhood. Usually, symptoms only present themselves in adulthood. H. pylori causes more than half of peptic ulcers worldwide.2 The bacterium causes peptic ulcers by damaging the mucous coating that protects the stomach and duodenum. There is damage to the stomach lining and this allows stomach acid to get to the sensitive lining. Together, the stomach acid and H. pylori irritate the lining of the stomach or duodenum and cause an ulcer. Yet, most people infected with H. pylori never develop ulcers. No one knows why. Most likely, development of ulcers depends on characteristics of the infected person; the type, or strain, of H. pylori present; and factors researchers have yet to discover. 2Helicobacter pylori and peptic ulcer disease; economics of peptic ulcer disease and H. pylori infection. Centers for Disease Control and Prevention Accessed February 23, 2009. Researchers are not certain how H. pylori is transmitted, although they think it may be spread through contaminated food or water. Bad food or water, not washed or purified properly, can have the bacteria. The infection can spread from person to person. Studies suggest that having contact with the stool or vomit of an infected person can spread H. pylori infection. And H. pylori has been found in the saliva of some infected people, which means infection could be spread through direct contact with saliva. There are some sufferers who suffer no symptoms. If you have an ulcer, your doctor will first ask you about over-the-counter drugs you are taking. Patients who are taking an NSAID are asked to stop, reduce the dose, or switch to another medication. Then the doctor tests to see if H. pylori is present. Getting tested is important because H. pylori-induced ulcers are treated differently than ulcers caused by NSAIDs. Blood test. A blood sample is taken from the patient's vein and tested for H. pylori antibodies. Antibodies are substances the body produces to fight invading harmful substances-called antigens-such as the H. pylori bacterium. Urea breath test. A patient takes something labeled with a special atom of carbon. After a few minutes, the patient breathes into a container, exhaling carbon dioxide. If the carbon atom is found in the exhaled breath, H. pylori is present, as this bacterium contains large amounts of urease, a chemical that breaks urea down into carbon dioxide and ammonia. Stool antigen test. A stool sample is tested for H. pylori antigens.